Dry open, usually sandy, ground, as on hillsides or bluffs: clearings and openings in oak forests. 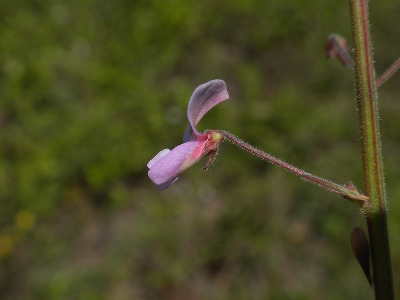 When in flower, members of the Desmodium paniculatum complex can easily be keyed to this species because of their small flowers (although the corolla is usually at least slightly longer than 6 mm). The two common members of the complex, D. paniculatum and D. perplexum, can be easily distinguished, as they lack the hooked hairs on the stem that are a feature of D. obtusum. The less common D. glabellum does have hooked hairs, but it has broad leaflets, the widest usually 2.5–4.5 cm wide, while the widest leaflets of D. obtusum are rarely more than 2.5 cm wide. MICHIGAN FLORA ONLINE. A. A. Reznicek, E. G. Voss, & B. S. Walters. February 2011. University of Michigan. Web. 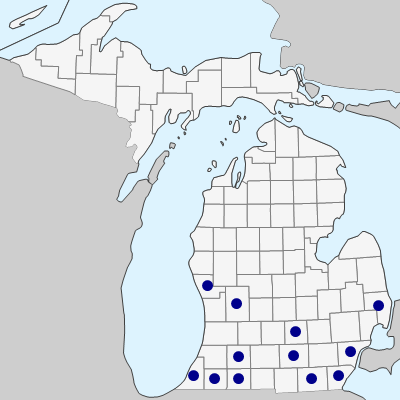 April 20, 2019. https://michiganflora.net/species.aspx?id=1296.